When it comes to gift giving, they say it's always the thought that counts. But this Christmas, some of the biggest ideas require some assembly. 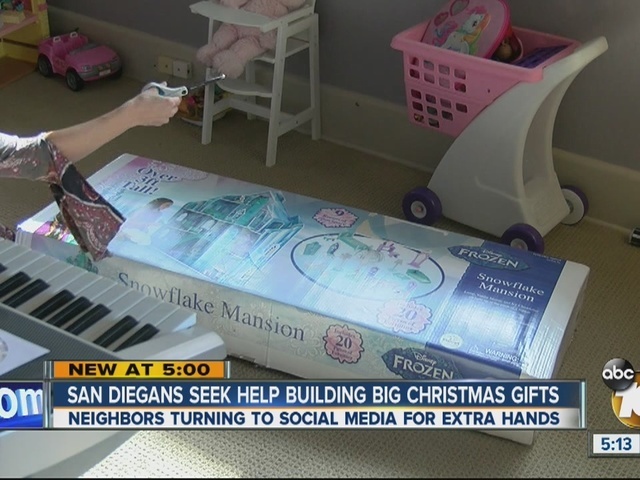 This year, some San Diegans are coming up with new ways to get an extra hand. That’s what Michelle Mitchell did when she bought a Disney’s Frozen Ice Castle for her two-year-old daughter, Harlow. It was her special wish for Christmas. But there's one palatial problem: less than a day before Christmas, Michelle, a single mom and attorney, wasn’t about to try building the 45-inch tall castle herself. ”That’s not my thing,” she said. It was enough trouble opening the boxes. That just led to more boxes, and under those, 20 pages of instructions, and dozens of screws. Michelle needed help. And fast. She posted on the hyper local social media site Nextdoor, where posts are only viewable to neighbors. She offered a high school or college student $30 to put it together. And he arrived this afternoon. For others who don't have someone next door, there are all sorts of assembly services in San Diego. In fact, many of the ones that put together Ikea furniture also do sporting goods, swing sets and toys. You can find some of these services by searching online for "handyman services" or "furniture assembly." But now that Michelle is covered, Harlow will wake up Christmas morning to her new castle, and do anything but freeze. And that will make Michelle melt.